Wow -- just browsed through the collection -- amazing that they got SO many of the character so right to my eye (the Surfer, Dr. Doom, Thanos, Dr. 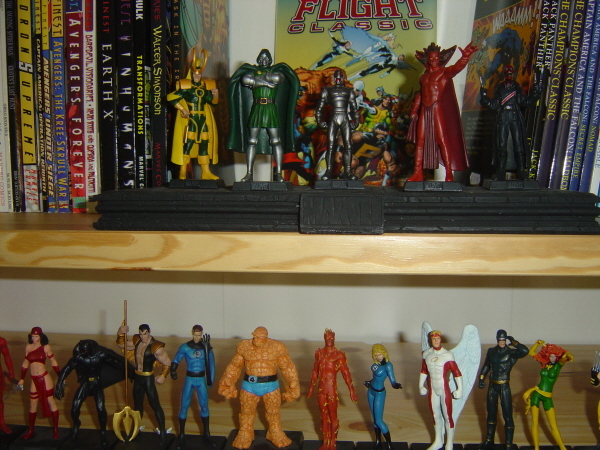 Strange, Angel, Iceman, Phoenix, Captain America, Thor, Colossus, the Vision, etc. ), while they got others SO wrong (Cyclops, Beast, She-Hulk, Iron Man, to name a few). Some are in-between -- Reed Richards seems a little "off" for some reason (not quite what I picture as an "on-character" pose, perhaps), and the Wolverine is nice enough, but the costume hardly qualifies as "classic" to me; others don't seem exactly right, but they look very good as depicted (Rogue doesn't look quite like what I picture as the "classic" version, but their portrayal of the character and the costume choice seems "right"). All in all, a very, VERY nice collection. If they had included a classic red-and-gold Layton era of Iron Man, I would probably be forced to put together an Avengers set. The magazines are very nicely put together and as has been said JB's art is often in there. This is an odd thing to say about a 3 inch tall lead figure, but while I will confess I am not thrilled with the grotesquely huge arms they gave Jennifer, it would seem from that single picture that they at least got her attitude right. They did a larger size version of the hulk and a spider-man too. Yeah they are both there although you can't quite see the Spidey on the roof. Is there a mod who can fix my post so that's not so widescreen? While there are a minority of dogs, some of these are spot on! Leigh, those are three photographs you have posted. Just edit and drop the second and third onto the next paragraphs and it will solve the widescreen dilemna. I checked my LCS today. They had four of these in stock -- unfortunately four I did not want. However, I did get a chance, on the basis of these, to see the kind of quality involved, so I will certainly be emailing in a list of the ones I do want. On a side note, I picked up the "Batman Thru the Ages" set of four action figures. I could quibble with the box copy -- the Alex Ross version is not the one I would call "Classic Batman" -- but the craftsmanship is good. The "Super Friends Batman" clearly came from a different set (as perhaps they all did -- just not so obvious with the other three). But a good buy, I'd say. Also picked up the JSA Hawkgirl -- who happens to be the one I drew in that single issue of HAWKMAN I did a while back, so that sort of makes her "real". Again, a nice job on the modeling. Which one of the figurines would be first on your list JB? The Hulk special is pretty good. I was disappointed with some of the "classic" renditions particularly Mystique. White dress! White dress! I checked my LCS today. What is that like? Are they used to you, or is it a "big deal" when you show up? Do you ever do any local signings? Ordway is in CT also right? Ever see him around? Do you mean Captain Britain JB? Surprised you like the Thing. It doesn't look like your Thing and that's the only one as car as I'm concerned. The Dr Strange is one of my favourites. All but Union Jack can be seen on their site and are due out in the next ten issues. I have not seen him on any lists. 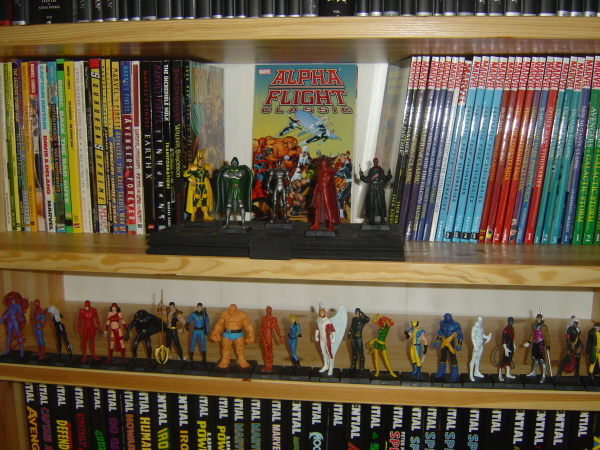 There was an introductionary magazine with a poster with the figures divided into 5 groups with 17 Avengers, 17 X-men, 17 Spider-man, 17 Fantastic Four and 17 Marvel Knights. I don't see him on the list. Some little friends from Paris! How much do these retail for? I've seen anywhere from $7.97 - 20.00 on eBay and I'm wondering what they cost at the store. If you mean the figurines Matt, they are £6 which is about $12. 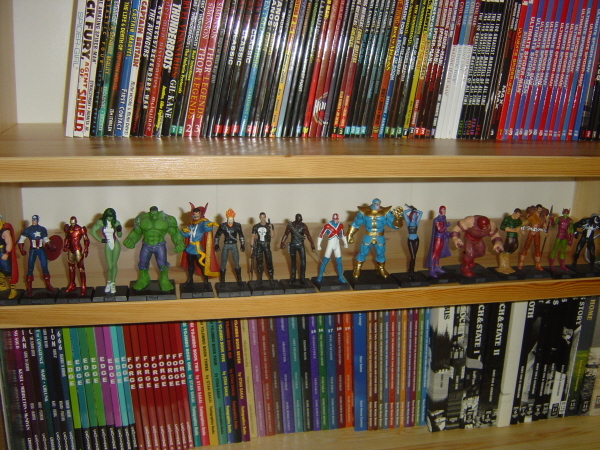 I have all the FF (including former members Medusa and She-Hulk). Looking forward to Galactus. Matt, where do they sell them in the US? My LCS orders them. He just started doing that. Talk about coincidence! 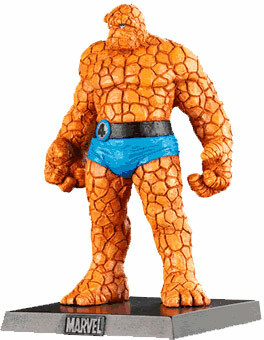 This thread appears the very same week my LCS gets his first shipment in with the Thing figurine that I couldn't pass up. Told my girlfriend that I'm thinking I've got a yen to collect these and she just rolled her eyes! I went by my LCS today and they had Namor, Dr. Doom She-Hulk and Captain America arrived today. Got the Captain America figure and I'm impressed by how nice it is.